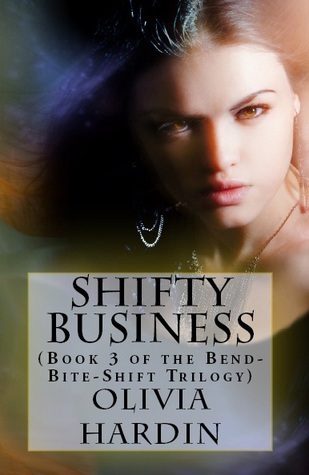 Shifty Business is the third and final book in Olivia Hardin's Bend-Bite-Shift trilogy. The book begins at the auction of the children from the first book and follows Gerry and Nicky's storyline. I like how the second and third book follows the character's story from the point they branched off from the first book. While at the auction, working undercover, Gerry is handed a silver box by a little girl. Then she notices a familiar smell, one that reminds her of her sister, Dysis. Gerry and her sister can communicate telepathically, and as soon as she receives the silver box, Dysis begins attacking her mentally. Dysis wants the box and will do everything in her power to take it. Before passing out from the strain of blocking her sister from her thoughts, she gives the box to Nicky and implores him to hide it. With the Company (the supposed good guys their team works for) cutting off their funds and all safe houses compromised, Nicky returns to his roots in New Orleans. With no support expected from his teammates, Nicky is left to discover how to awaken Gerry and figure out who is attacking them and why.